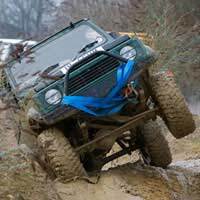 Although 4x4s are still cars, off roading requires different driving skills to a regular road car. It takes much more skill and concentration to handle a 4x4; even more so when you consider the diverse terrain that it can cover (from hills to slippery mud, and almost every surface in the middle). Because of this, an introductory driving lesson and safety briefing is included as part of the driving experience packages, so that you can safely negotiate the challenging tracks. Don’t’ worry though - you won’t be left to your own devices. A trained instructor will be sitting in the car with you at all times to make sure nothing too eventful happens! Off roading is an exhilarating experience, but it‘s not for the faint-hearted!. You can go from tackling steep hills to plunging through ditches and muddy water - and everything in-between. Prices vary, but a typical 90-minute driving package generally starts at around £90, and the average two-hour package at around £130. Some offer half day and full day packages, which often includes between one and two hours to get used to driving the car, as well as one to two hours of actual driving time. This is a useful option if you think it might take you a long time to get to grips with the car! Corporate off roading is a novel way to spend time with your workmates. You (or your company!) can buy a package that lets up to three of you use the same car. After the initial safety briefing and driving instruction, you can take in turns to assess each other's driving skills (just don't criticise you boss's attempts at navigating the muddy ditch!). Instead of hitting the town for your stag night and being tied to a lamppost, why not try off roading instead? Battling against a wide range of conditions is a sure-fire way to let off steam before the big day. Splashing through the mud is a typical male activity, but there's nothing to stop women from having a go too. Choose off roading for your hen party activity, and keep your friends entertained for weeks afterwards. If you're feeling really brave, try a combined stag and hen party, and see whether it's the boys or the girls who get to grips with the car first (and who can make the most mess in the process!). If you've got a strong sense of adventure and are always up for a challenge, 4x4 off roading could be the perfect activity for you. It might seem a bit daunting to find out that you could be tackling steep hills one minute, and splashing through muddy ditches moments later, but this is one of the things that makes off roading so much fun! Your safety briefing and driving introduction should be more than enough to see you through your session, but you'll have a trained instructor alongside you throughout, so you won't be on your own if you do happen to run into any difficulties. Can I Afford to Take Up Golf?